From ‘Twin Bridges’ south of the Village, the Track follows the Donnelly River. Tom Road is the only campsite retained from the original 1970's alignment of the Track and overlooks a permanent pool in the river amongst granite boulders and massive karri. It’s a lovely spot for a swim. South of Tom Road, One Tree Bridge on Graphite Road is a very popular tourist spot. As the Donnelly River meanders towards the coast, the Bibbulmun Track wends its way through the river valley. On leaving the Donnelly Valley, the Track turns east and passes through Beedelup National Park. 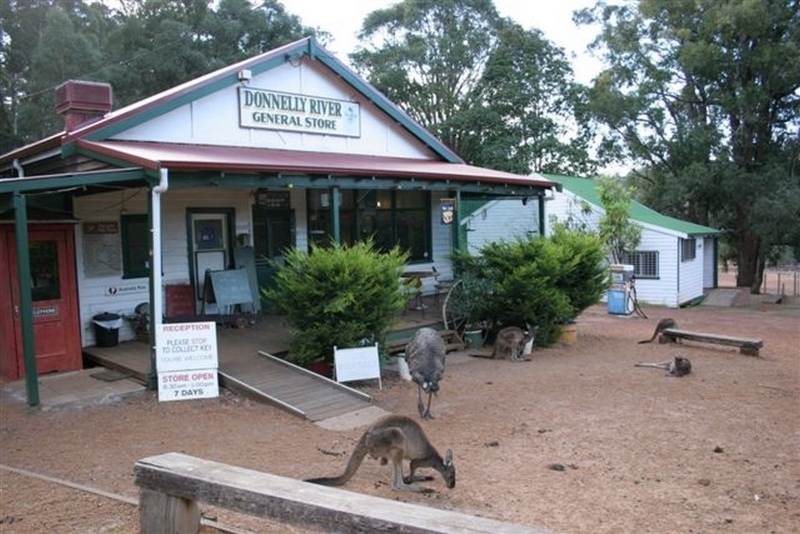 Shortly after entering the park, the Track reaches the shore of a deep, tranquil lake, home to the Karri Valley Resort, a luxury tourist retreat, and then crosses the Beedelup Falls. The Falls are the focal point of the park, framed in spring by blossoms of golden waterbush, starry white crowea and purple tree hovea. 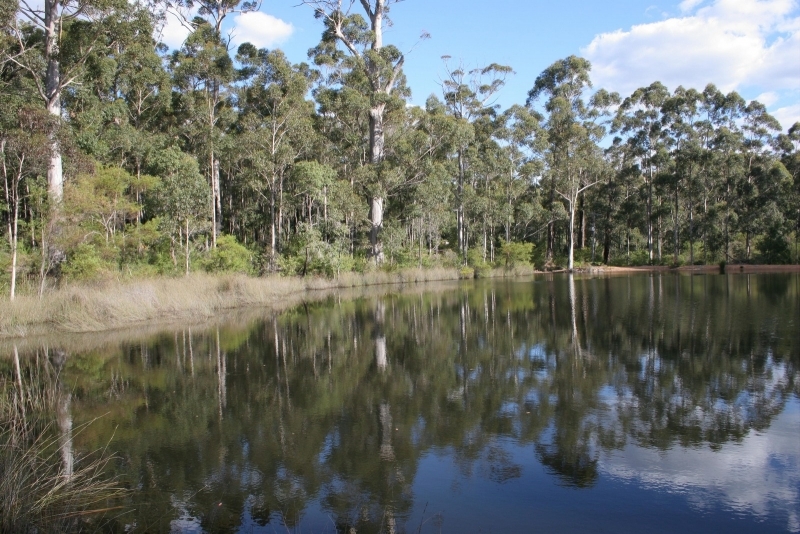 Beedelup National Park is named after Beedelup Brook, which has been shown on plans since 1875. It is likely to be derived from an aboriginal word ‘beedja’ meaning sleep, so ‘beedjalup’ would mean ‘place of rest’, which would be appropriate since Beedelup is a popular and peaceful recreation area. North of Pemberton the Track passes the Big Brook Arboretum, a popular picnic and camping area featuring mature, exotic trees. Three mills were here in the early 1900’s and cut half a million railway sleepers for the new Transcontinental Line, which was completed in 1917, running between Port Augusta and Kalgoorlie, crossing the Nullarbor Plain. 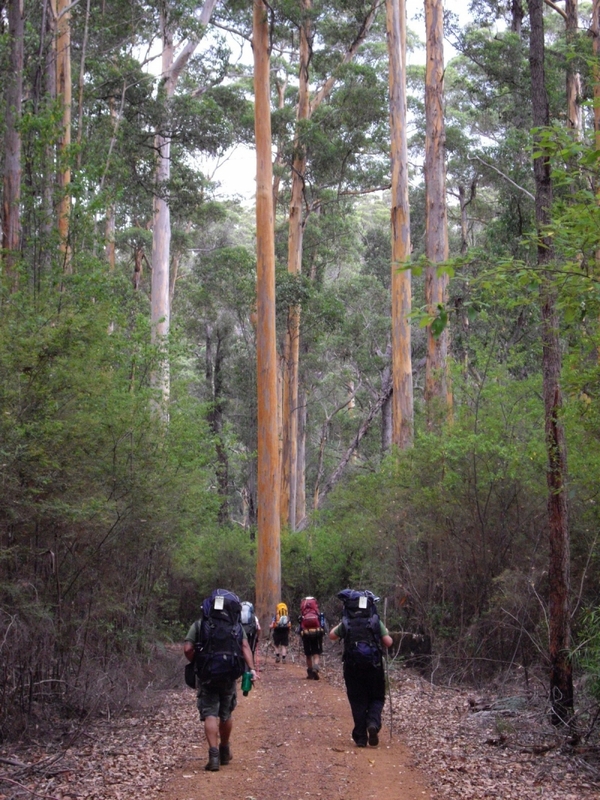 The Karri tree grows to 90 metres, making it one of the tallest species in the world. After passing Big Brook Reservoir the Track joins the Rainbow Trail, once a railway and now a scenic drive overlooking Lefroy Brook. This entire area was clear felled between 1920 and 1928. Sparks from a bush locomotive started a fierce wildfire in the debris which littered the forest floor. The fire stimulated the surviving karri trees to shed millions of seeds onto the rich ash-bed. The result of the thousands of seedlings, which then sprouted, is today's dense, lush forest. ‘Karl’ (fire) has been used by the Nyoongar Aboriginal people for tens of thousands of years in caring for the countryside. Many native plants actually rely on periodic fire for their survival as a species. Settlers arrived in this area in the first half of the nineteenth century. The magnificent karri trees led to an early attempt to set up a timber industry, but transportation was too difficult and the project failed. The settlers turned to farming, producing fruit and vegetables and grazing cattle. In the late nineteenth and early twentieth centuries, new technology enabled the settlers to return to the concept of making an economic return from the huge trees, and three timber mills were set up. For more information on walking from Donnelly River to Pemberton go to the Section by Section Guide.